What could make your wedding ceremony more extraordinary? Setting it against the backdrop of the stunning Gulf of Mexico! 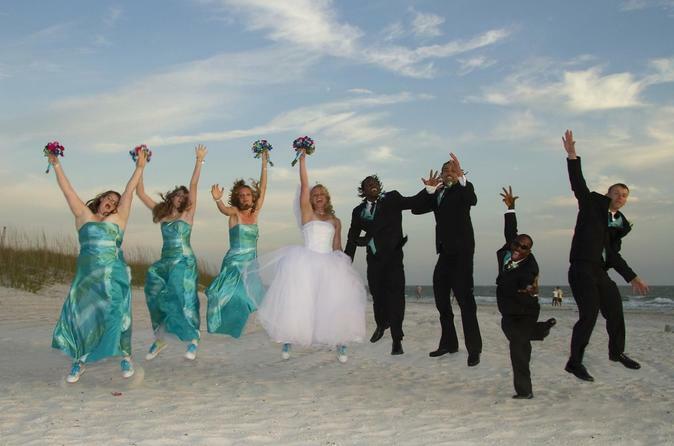 Together with your closest family and friends, renew your vows or say ‘I do’ on the powder-white sands of Clearwater Beach near Tampa. An easy and exceptional way to get married! On your special day, meet your licensed officiant at Sand Key Park in Clearwater near Tampa. When booking, specify the time of day for your private ceremony and whether you’d like a spiritual or non-spiritual service. Your officiant will perform the marriage ceremony and certify your union in the company of up to 10 guests. Afterward, celebrate with your own refreshments and admire the unbelievable beauty of the tropics! Your package includes 60 professional digital photos, which will be mailed to you on a CD following the event. Q: What are the requirements for a Marriage License? A: Both parties of the intended marriage must come into the Clerk's Office. Each party must have a valid photo identification such as a driver's license, state identification card, government or military identification card, or a passport. A social security number is required to obtain a marriage license. If either party is from a foreign country and not a U.S. citizen, alien registration documentation, or other proof which contains an alien registration number is acceptable to obtain a marriage license. If either party was previously married and divorced, the date of the divorce will be required. If the date of the divorce was within the thirty days prior to the new application for a marriage license, a certified copy of the recorded final order will be required. Q: Is there a required waiting period? Q: Are blood tests required for a marriage license? A: No, blood tests are not a requirement for a marriage license. Q: How long is the marriage license valid? A: The marriage must be solemnized within sixty (60) days of issuance of the marriage license. The ceremony can be performed anywhere in the State of Florida. Q: What is the cost of a marriage license? Q: Where can I apply for a marriage license? A: A marriage license may be obtained Monday through Friday, 8:00am to 5:00pm at any the offices of the Clerk of the Circuit Court.